Just regular folks. : Logistics, Nat's 30 and burros. It's been a long, cold week - a logistical nightmare although Jeremy didn't call it a nightmare, he just said we totally managed it fine. And we did. I worked at the hospital last weekend and then had Monday and Tuesday off. Monday, the kids were home all day - non weather related (end of the semester grades were due in for the teachers - or maybe they just needed a break). Tuesday, the kids went to school on time, but were sent home early at noon for snow. I was home, so I got Edda from Wootton. On Wed, I was at the hospital when the two hour delay converted to a closure. Jeremy had the kids (I'm not sure why I say the kids since Vince is fine on his own so I should just say Jeremy had Edda). Jeremy had Edda again on Thursday when I was at the hospital for a two hour delay. Today (Friday), Jeremy went to work and it was me to pick up Edda when school closed again at noon. Next week, it'll be in the 50s? 60s? It'll be great. 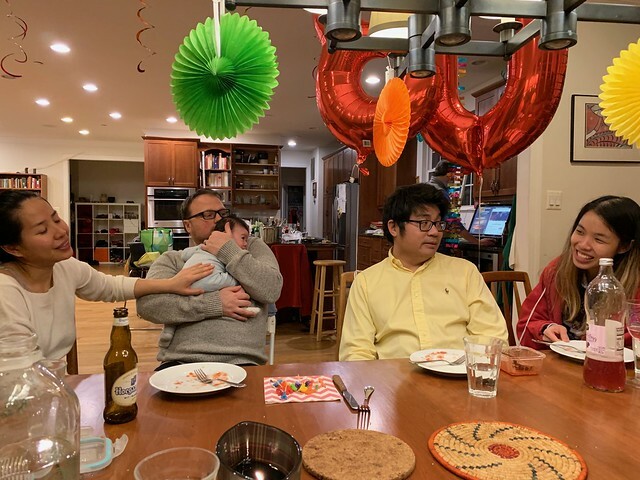 On Tuesday, despite the snowstorm, we had a party for Nat's 30th birthday. No one had to travel very far, Ning & family from the downstairs and Nat & Dara from about a mile away. 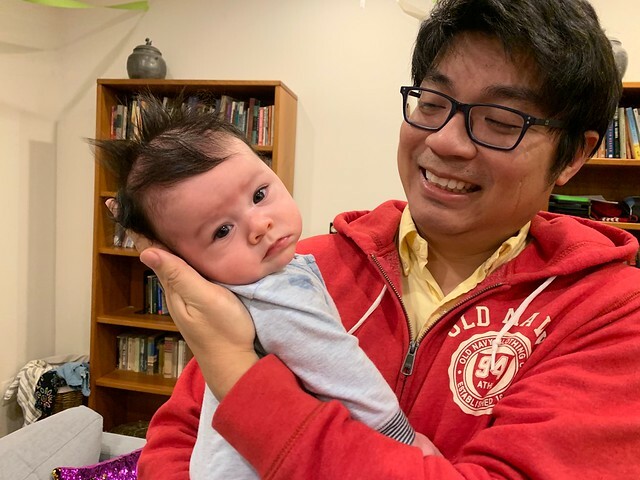 The baby is super cute! Dara was very good at getting him to smile. 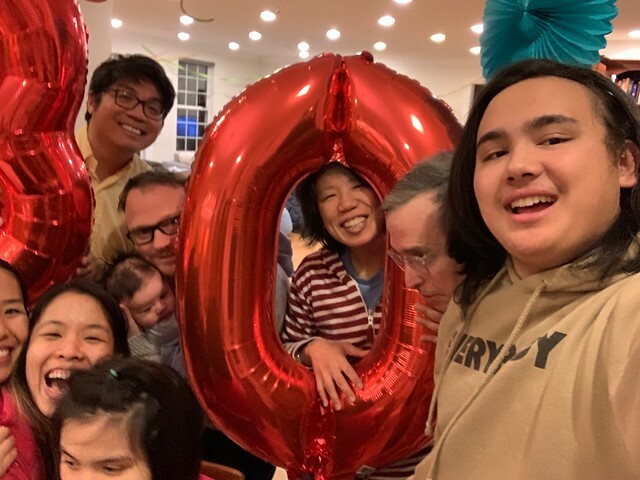 During Nat's party, Jeremy had to deal with entering the lottery for the Boy Scout's Philmont trip he's organizing for this summer. 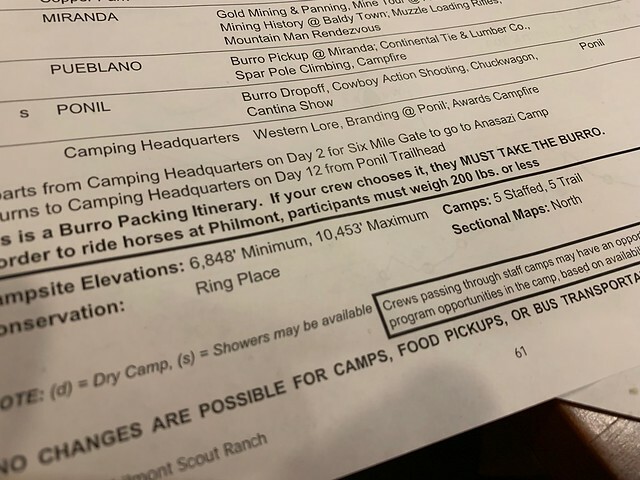 There are about 25 different itineraries to pick from - the boys had spent a bunch of time picking their top six or eight. Very happily, they got their #1 choice. 68 miles of hiking with a good mix of daily programming. The most funny of which is Burro Packing. I like that the itinerary says - you must take the burro. There are a lot of videos on YouTube which show stubborn burros refusing to budge on the trail. Great food and great people with awesome styling and interior. Also great Los Angeles venues for cheap happy hour drinks. However, the downstairs beer selection is about as standard as it can be while upstairs can be a bit more creative.